Goodreads Summary: In this stunning sequel to the highly acclaimed "Daughter of Smoke and Bone," Karou must come to terms with who and what she is, and how far she'll go to avenge her people. Filled with heartbreak and beauty, mysteries and secrets, new characters and old favorites, Days of Blood and Starlight brings the richness, color and intensity of the first book to a brand new canvas. Why am I waiting on Days of Blood and Starlight (Daughter of Smoke and Bone #2)? Daughter of Smoke and Bone was incredible! You can read my review here. It was easily one of my favorite books for 2012 and I have been anxiously awaiting the sequel ever since. 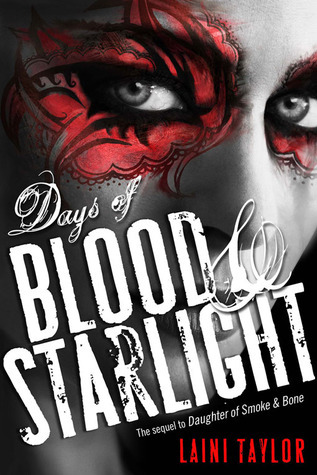 Additionally, the cover of Days of Blood and Starlight is so beautiful and complements the first book perfectly. What books are you waiting on? This was my WoW today as well and with the cover having been released this week, I can imagine it will definitely be making the rounds today! I just finished Daughter of Smoke and Bone last night. Now I NEED it to be November as DOSAB easily makes my favorite reads thus far this year. Totally with you on this one! Can't wait for this book!!! I cannot even begin to tell you how desperate I want to read this book!! I loved the first one so freaking much and I can't wait to get my hands on this one! Plus, the cover is incredibly gorgeous!!! Just spotted this on another blog! I have Smoke and Bone but I haven't managed to get to it yet. I will though - promise! Splash Into Summer Giveaway Hop! Love in Bloom Giveaway Hop!